Last week I did my first ever business Facebook Lives, and in the spirit of repurposing content, I want to turn those Facebook Lives into blog posts (because sometimes reading is better/easier/the only option). The success message or thank you page either tells them to confirm (when they don’t need to), or it doesn’t tell them they need to confirm (when they do need to). If you’re using a single opt-in, then you need to remove all the default language about confirming the subscription. If you’re using double opt-in, then it’s very, very important that you make it super clear in the success message, or on the thank you page, that they need to go and confirm their subscription/email address. Here’s the thing about Incentive Emails, and where I see people going wrong allll the time: you need to make it clear in the Incentive Email subject line, email body and on the button exactly what they need to do and what’s going to happen when they do it. ConvertKit’s Incentive Emails are super clever, you can give them a free thing and as they click on the button to download: “oh, would you look at that, you also just confirmed your email address!”. But, I’ve found that if people don’t realise they have to click on that button to confirm their email address, they may save the email for later (when they’ve got time to look at your free thing properly), and let’s be honest, how often do we go back to look at emails we’ve saved? Body of the email something like: Click the button below to confirm your subscription so I can send your emails and to automatically download [insert free thing name]. Body of the email something like: Click the button below to automatically download [insert free thing name]. Body of the email something like: Click the button below to confirm your subscription. So basically, always make it super clear what they need to do and what will happen next. And on a similar note, just because you can upload huuuge files to an Incentive Email definitely does not mean you should. Let’s say 12mb max. And please please please never upload videos – upload those as unlisted on YouTube. And before you ask, don’t worry about the ‘send subscriber data to thank you page’. It’s for a couple of specific integrations. If you haven’t read in an integration help article that you need to check/tick it, then it doesn’t matter if you do or don’t. Sometimes I have clients who are confused why ConvertKit is not collecting subscribers’ first names. And more often than not it’s because they’re using the minimal form style. All 4 landing page styles and 2 of the 3 form styles collect first names, except for this sneaky one. Now, obviously you don’t have to collect first name, and I’m sure there’s some research out there that says getting a subscriber’s first name and email address reduces the number of signups. But I’m going for personal connection + quality over quantity, so first names for me please! What if you’ve got a mixture of subscribers with both first name and no first name? Where is the “X” to close a form or landing page. I do like that not being on a form. I’m not quite sure I understand the question. 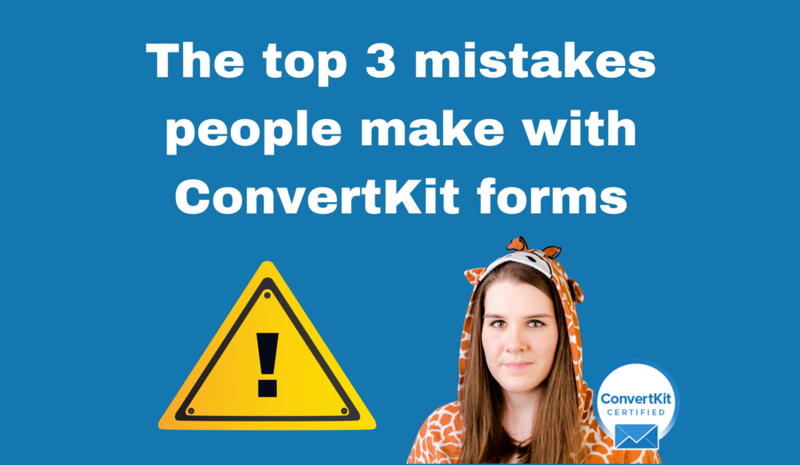 There is no ‘X’ button on forms or landing pages unless it’s a popup/modal form.